A trip on the water gives a lot of positives, but it was even more enjoyable and exciting if you go on the catamaran, which was built with his own hands on the advice of experts. Runduce partitions, covers, hinges, scuppers, deck section, recessor, motor, podmoscovye pillers, face shields, dinislamova paneling, foam filler, steel, fiberglass, plywood, paint. Glue the two side runduce section. The lids attach special of the loop in order not to lose them. Equip the lockers with scuppers. Prepare for deck section special box – recessor. It will be the motor. Perform cutting work parts vertical main section, which is attached to be brands. Install podrachivala of pillers, medium frames, end shields. Attach gamelobby trim, equipped with foam filler. Fabricate the tube for support. To do this, take your chosen as a support tube, glue it with several layers of fiberglass. Saw through the tube along so that it was easy to remove the layout from the pipe. Put it on again, but the cut was a strip of polyethylene. Then where you want to locate and palate top four layers of fiberglass. Prepare the foam bookmarks and attach them to a top brand. Plywood thickness 10 millimeters fabricate reinforced tabs that will be used on the top brand at the ends and on front inclined part. Attach the upper front plate on the front stinger, reinforced Central cushion and the side plates. Then, the sheet attach to the frames and pillers. Carefully sachette and paint in your chosen color. With the help of foam, run the gain on the transom and fairing. Glue all the fiberglass in one layer, and the bottom two layers. Leave on the assembled catamaran place to place. Be sure to check the strength of fasteners is performed during Assembly of the catamaran. If the Assembly is made to be of poor quality, then the catamaran is dangerous to go on a trip! Paint the bottom of the bridge in red. This is very important! If the catamaran capsizes, it will be more conspicuous from the air. The catamaran is one of the most convenient vessels for water tourism. It is fast, easy, robust. 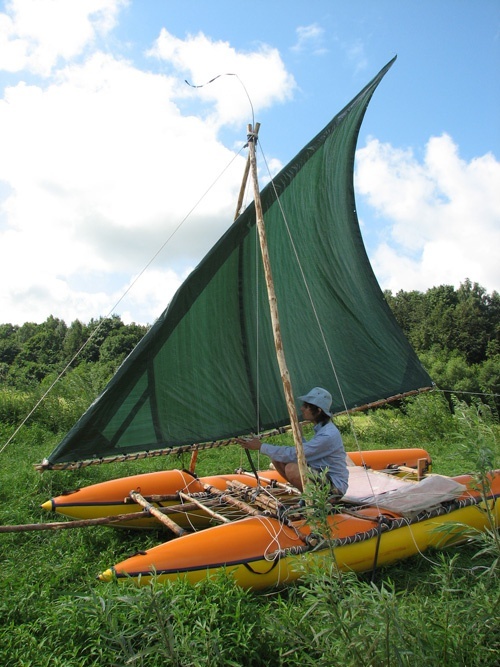 In this case the simplest catamaran is easy enough to do yourself, for its construction does not require scarce and expensive materials. The first step is to decide what tasks will solve your catamaran. It's one thing if it is needed for rafting on mountain rivers, and quite another if you're going to travel in sailing in large bodies of water. The features of the catamaran is the most direct influence on its design. The best option in the construction of catamaran is to choose as prototype an already existing self-built catamaran, the most suitable in size and purpose. Drawings of such catamarans are easy to find online. The prototype is selected you can modify the way you want, but the design of the main load-bearing elements should not be changed. Usually catamarans, we offer for self build, already reproduced in a large enough number of instances, the design is well worked out and change it without the need of not worth it. The basis of the catamaran is a frame of aluminum tubes, to which are attached the cylinders. Inflatable air bags have two-layer construction: the outside cover of canvas or other durable fabric, it carries most of the load. Invested inside the cylinders, in the simplest case they can be made of a polyethylene sleeve. Their task is to keep the air, so that the internal configuration is not so important. In size they must be more durable outdoor cover. For the safety of the inner cylinders is better to make several separate sections, in this case, when accidental puncture of the catamaran will stay afloat. To assemble the catamaran, use only stainless steel fasteners, this will save you from many problems. Special attention to fastening of the cylinders – they should not RUB against metal parts. If the cylinder where it rubs on the waves, he quickly wiped, with all the ensuing unpleasant consequences. 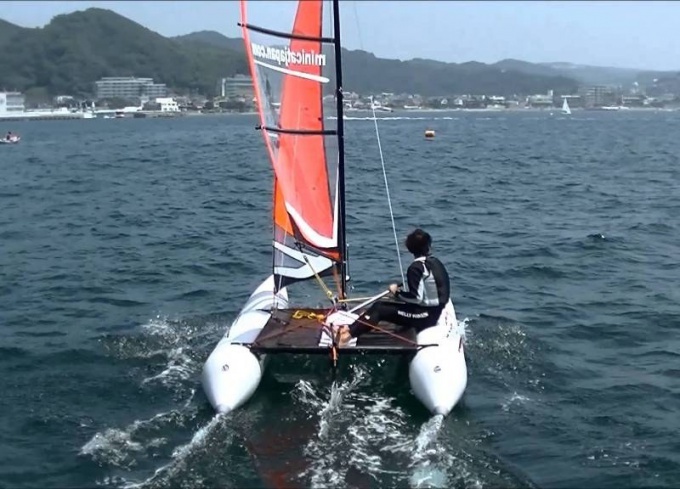 If the catamaran is equipped with a mast, it is desirable to provide safety mechanisms, automatically etching sheets, when it reaches a certain effort. This is due to the fact that the overturned catamaran is almost impossible to turn back, and with a strong sudden squalls are not always possible in time to ease the sheets just a few seconds to catamaran overturned or stayed with the broken mast. So security should take care in advance. Do not skimp on materials. Use high-quality aluminum pipe, good materials for tanks and mounting straps. And worry about the comfort of the crew on the catamaran should be comfortable and safe to move around, so make at least a small deck, the space between the cylinders in the bow and stern should be tightened with a durable mesh to withstand the weight of a person. Remember that inflatable catamaran it punctures the cylinders are the main issue. Therefore, make sure that a single puncture was not for your fatal construction and design of the catamaran allowed in the shortest terms to execute any necessary repairs.